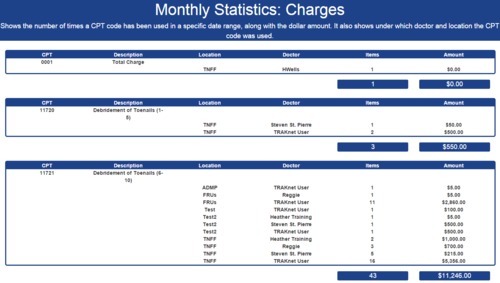 The Monthly Statistics - Charges report is an Advanced Report which displays the number of times a CPT code has been used in a specific date range, along with the dollar amount. It also shows under which doctor and location the code was used. This report will show all charges that were entered into TRAKnet as seen in each encounter. CPT — The CPT code used. Description — The description of the CPT code. Location — The facility where the treatment was rendered. Each CPT code will be grouped by facility. Doctor — The rendering provider for each CPT code. Items — The number of times that CPT code was used. Amount — The total amount charged for that CPT code. In addition to the above, two totals will show at the end of each CPT code, showing the total number of times used and total amount.